How to: Use a circle punch to notch the corners of a gray/yellow striped layout background. Watercolor the edges then stitch around the edges using silver floss. Place a doily on the center of the layout. Punch doilies from all the papers in the Cut & Paste collection then layer them in a circle around the doily. Sew around the punched doilies to secure them in place for infinity (and beyond). Place a photo collage on the middle then back each corner with a fabric photo corner. Make a title across the middle using assorted Thickers. Add a number sticker to each photo to tell the month. Accent the punched doilies with sequins and puffy heart stickers. Journaling says: Every day I still pinch myself - I can't believe we actually live in Germany and get to see surreal towns like this every day! How to: Die cut the title from the bottom of a grid paper layout then spray red, orange, and yellow mist over the title. Back the title with green patterned paper and a colorful polka dot paper strip. Drop more mist across the layout. Place a collage of photos across the top half of the layout. 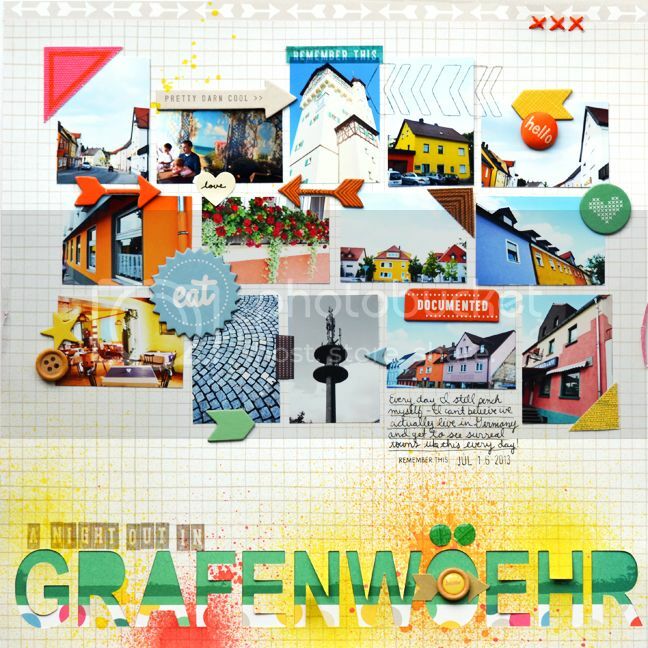 Use stickers, chipboard, a fabric brad, and buttons to embellish the photos as shown. Apply a chevron rub on to one of the upper photos. Back the top edge with an arrow paper strip. Stitch three orange "x"s on the top right corner. 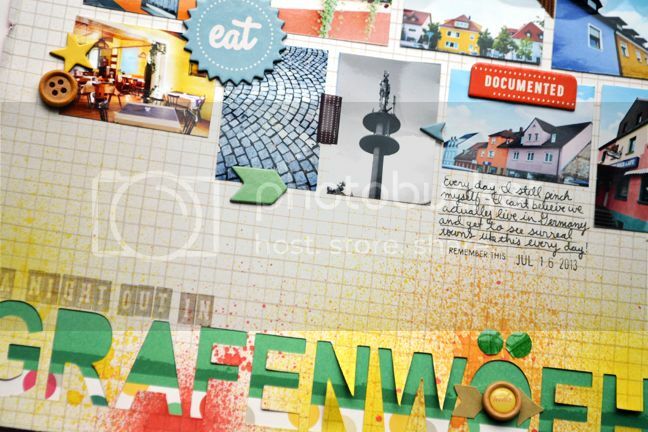 Finish the title with vellum letter stickers and create an umlaut over the "o" using green epoxy dot stickers. Write journaling below one of the lower photos and stamp the date below. That's all for now! I'm loving the Cut & Paste collection!! I love the sweetness of the 1st layout and all the hand/machine stitching! The pops of color and arrangement of the 2nd is wow! These are beautiful! Love all the photos and details! 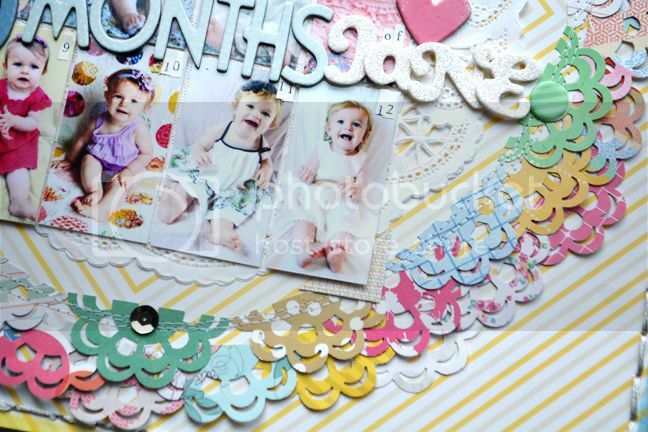 Love those punched doilies on your first layout Paige, and the colors look awesome with your photos on the second layout! These are gorgeous!!! I love love love the colors on the first one!!!! amazing, incredible colors, the cutest baby girl and amazing photos! love the both! Fabulous! I love what you do with paper!